"Old Testament ideas on land ownership and marked ballots were not the only indications that Utah's earliest settlers were bent on creating a society altogether unlike the rest of the country. Soon after arriving in the Great Basin they even undertook to create a new method to write the English language. 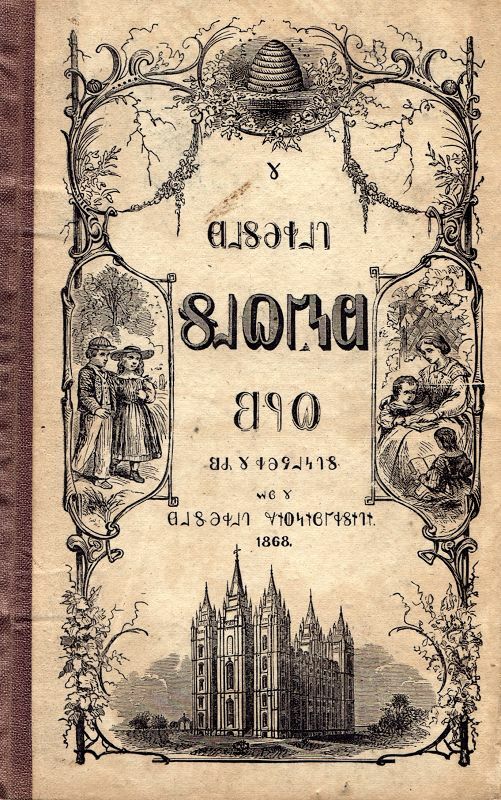 "In 1854 the University of Deseret, predecessor of the University of Utah, introduced the Deseret Alphabet, consisting of thirty-eight characters to conform with the basic number of sounds in the English language. The curious set of symbols was created by 39-year-old George D. Watt, an expert in Pitman shorthand and the faith's first English convert. "Aimed to reform the representation of the English language, not the language itself, the new phonetic system offered a number of advantages. First, it demonstrated cultural exclusivism, an important consideration. It also kept secrets from curious non-Mormons, controlled what children would be allowed to read, and in a largely unlettered society that included non-English speaking converts, eliminated the awkward problem of phonetic spelling. For such reasons, for nearly two decades Brigham Young pushed the new alphabet on reluctant followers. The church-owned Deseret News at Great Salt Lake City, Utah's first newspaper, published portions of its 1859 editions in the distinctive system. And the University of Deseret's board of regents at one time voted $10,000 to print text books in the alphabet for students in classrooms across the territory. "At a meeting of the board of regents, held in October 1853, Parley P. Pratt, Heber C. Kimball, and George D. Watt were appointed a committee to prepare a small school-book in characters founded on some new system of orthography, whereby the spelling and pronunciation of the English language might be made uniform and easily acquired. A further object was exclusiveness, a separate people wishing to have a separate language, and perhaps in time an independent literature. ...Finally, at a session held in December of this year, characters were adopted, under the style of the Deseret alphabet, the number of letters, or rather sounds, being thirty-two, of which the so-called vocal sounds were eleven, including six long, with short sounds to correspond, four double and one aspirate, and twenty-one articulate sounds. Thus the long sound of the letter e in meter was represented by a character resembling the Greek sigma reversed, the double sound of woo in wood by one resembling omega, the aspirate by phi, and the articulate sound of f by rho. While these characters are apparently borrowed from the Greek, this is also the case in the plates from which the book of Mormon is said to have been translated, where the letters pi, rho, tau, phi, chi, some of them as in manuscript, and others as in printed Greek, can be distinctly traced. "The new alphabet had 38 characters....But while the idea sounded grand, the alphabet failed entirely.